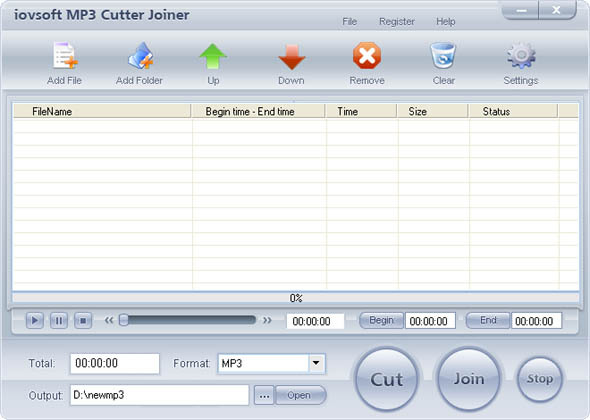 Iovsoft MP3 Cutter Joiner is an aspirational program for music lovers especially one who likes to create his own music. You can add single audio file or a folder to this program. The elapse time changes with the playing audio so that you can know at which time point you should start splitting, then after pre-listening, you can drag the progress bar directly to the time point you want and start converting. Apart from having two skins, Iovsoft MP3 Cutter Joiner adopts advanced LAME Encoder and OGG codec, which allows you to generate various qualities of MP3, WAV, WMA and OGG files. Iovsoft MP3 Cutter Joiner offers rich options for your special requirements. Support MP3 VBR and OGG VBR. It can join lots of excellent parts of audio files together too. This program can help you split one big audio file into audio pieces and convert them to MP3 or WAV or WMA or OGG format. It can merge several audio files or audio file segments into one big audio file. The elapse time changes with the playing audio so that you can know at which time point you should start splitting, then after pre-listening, you can drag the progress bar directly to the time point you want and start converting. Qweas is providing links to Iovsoft MP3 Cutter Joiner 6.5.8 as a courtesy, and makes no representations regarding Iovsoft MP3 Cutter Joiner or any other applications or any information related thereto. Any questions, complaints or claims regarding this application Iovsoft MP3 Cutter Joiner 6.5.8 must be directed to the appropriate software vendor. You may click the publisher link of Iovsoft MP3 Cutter Joiner on the top of this page to get more details about the vendor.